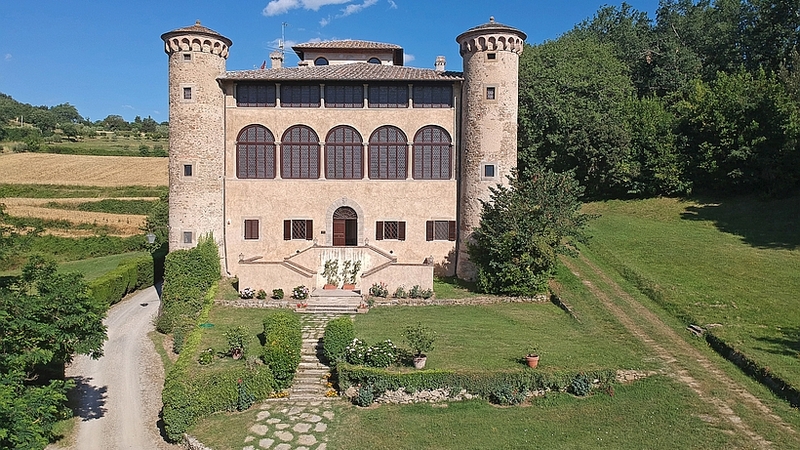 Tucked away into the hills of Arezzo lies the magic Castello di Galbino, a large and welcoming family estate with castle, gatehouse, farmbuildings and all, surrounded by seemingly endless fields and hills covered olive groves and woods. Galbino lies on a crossroad of Tuscany (Arezzo, Siena, Florence, Cortona), Umbria (Città di Castello, Perugia, Gubbio, Assisi) and the Marches (Urbino), an area where Piero della Francesca, Michelangelo, Leonardo Da Vinci, Raffael and San Francesco of Assisi were born. The nearest town is Anghiari at 4 km from Galbino, a charming medieval city which has not changed much over the last centuries. The powerful thirteenth century walls made the town an invincible fortress (picture of Anghiari). A stroll through the narrow streets which open onto delightful squares is Italy at its best. Anghiari has all shopping facilities. Castello di Galbino lies in Tuscany, not far from Arezzo. It is ideally located for excursions to Tuscany and Umbria. Many of Piero della Francesca’s works can be seen in the nearby town of Sansepolcro (15 minute drive) and you should not miss the village of Monterchi, where his famous pregnant Madonna can be seen in the village school. Franciscan trails: The hermitage of La Verna, where St. Francis received the stigmata is a magical place. By car it is reached in 30 minutes. A beautiful trek of 30 kms makes a wonderful day of walking. Romanesque Churches: The territory around Anghiari boasts a number of very early parish churches. They were built during the early phases of christianisation in which baptism was a crucial element. The pievi remained for centuries the only places authorised to carry out baptisms. The Castello dei Sorci, a rustic castle turned into restaurant serving very authentic food as for instance home made pasta. It is well know throughout Tuscany. Shopping: the famous factory outlet of Prada lies on the way to Florence. Shopping: Anghiari is also the headquarter of one of Tuscany’s most interesting textile producers Bussatti, whith shops all over the world. Woods are wonderful and one can walk or ride either a horse or a mountain bike along the clearly marked footpaths which are indicated on easily available maps. Tennis: the tennis club in Anghiari has a very nice teacher who also speaks English.